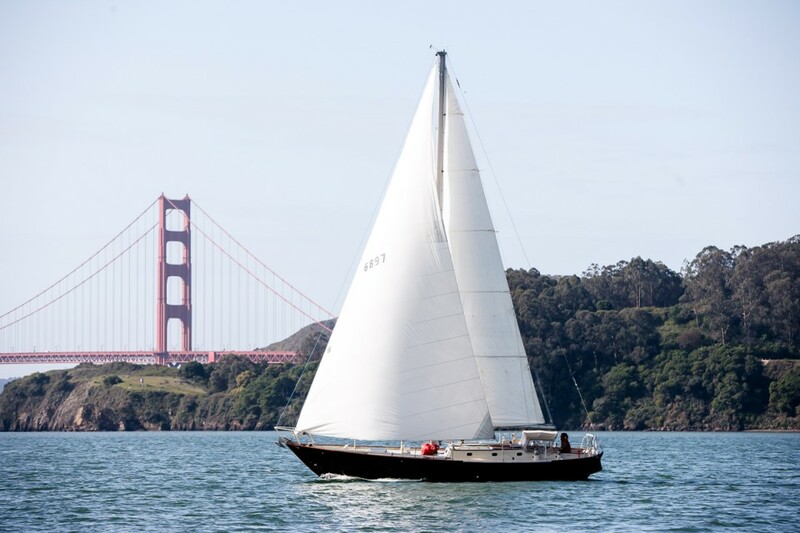 We then ducked under the Golden Gate, got a taste of the major south swell rolling in from the Pacific and so turned downwind to get a good look at Alcatraz. 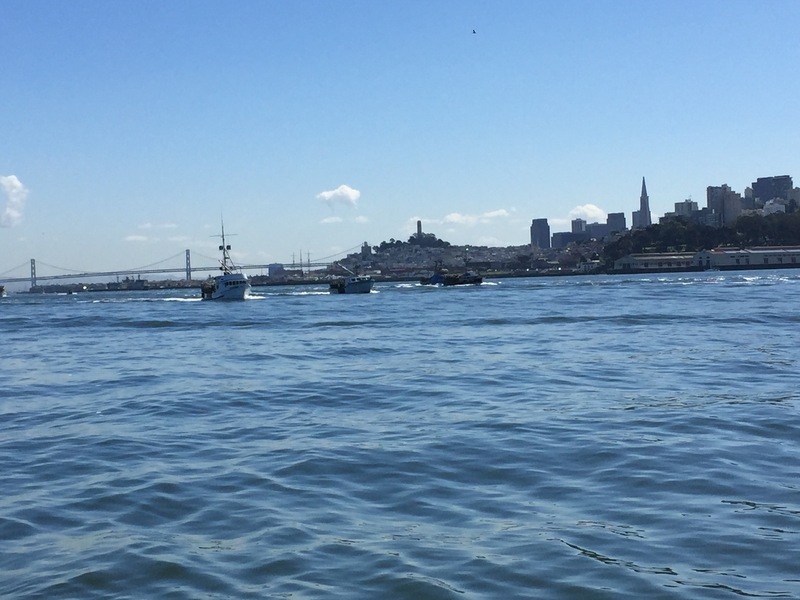 That’s when I noticed what looked like an exodus of about 200 vessels coming full steam ahead out of San Francisco. My first thought was that we were about to experience a major tsunami and people were heading out to sea to save their vessels. Then I realized the vessels were all powerboats about the same size and shape and heavily laden so I thought maybe it was some sort of flotilla or even a powerboat race. On a random Tuesday, though? 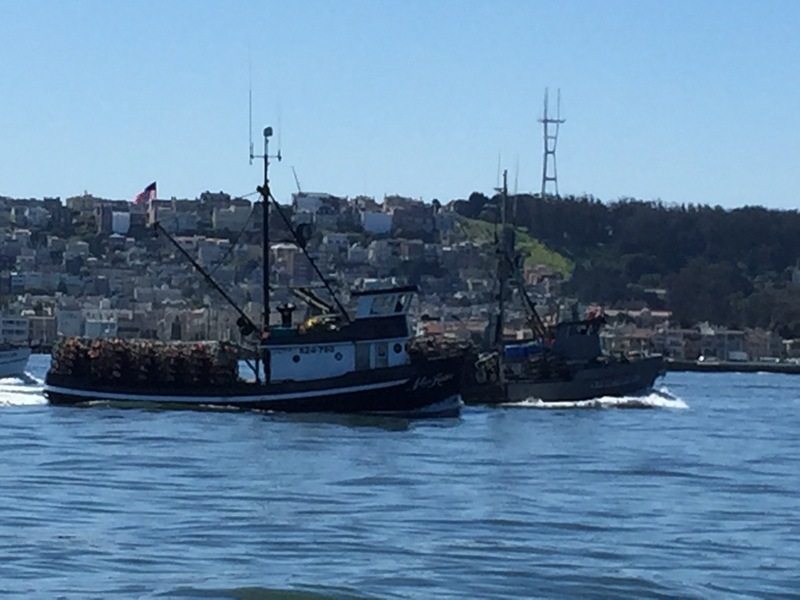 Nah, it turned out to be the commercial fishing fleet on the opening moment of crab season, flanked on either side by several coast guard vessels and probably fish and game officers as well. 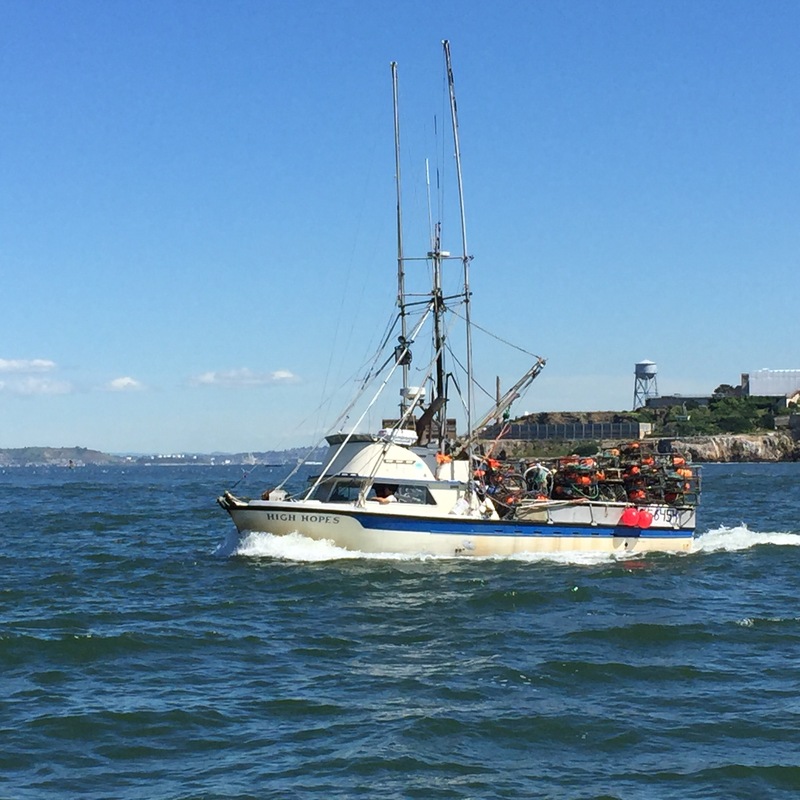 They waved to us in high spirits and proceeded full speed ahead for the fishing grounds carrying as much gear as each boat could hold, perfectly stacked to the gills. I have heard that the crab this year are too soft and not ready to be fished yet and if they do it will likely decimate the population for the future but last year there was no season here so the fishermen are getting desperate to make some money and will go even though they know it’s not the right thing to do for the future of the fishery. I’m not a biologist, however, and have to take other people’s word for this… Something to think and learn about. I wonder what I would do if given the choice of feeding my family now with the resources at hand or saving the future fishery for the next generation and finding another occupation knowing that others will just step in and do it anyway? And then again, maybe the biologists are managing the crab fishery just fine and it’s not such a bad time to pull pots after all? How do we know for sure? And just as these thoughts were rattling around in my brain and I was thinking about government regulation and interference in nature …. 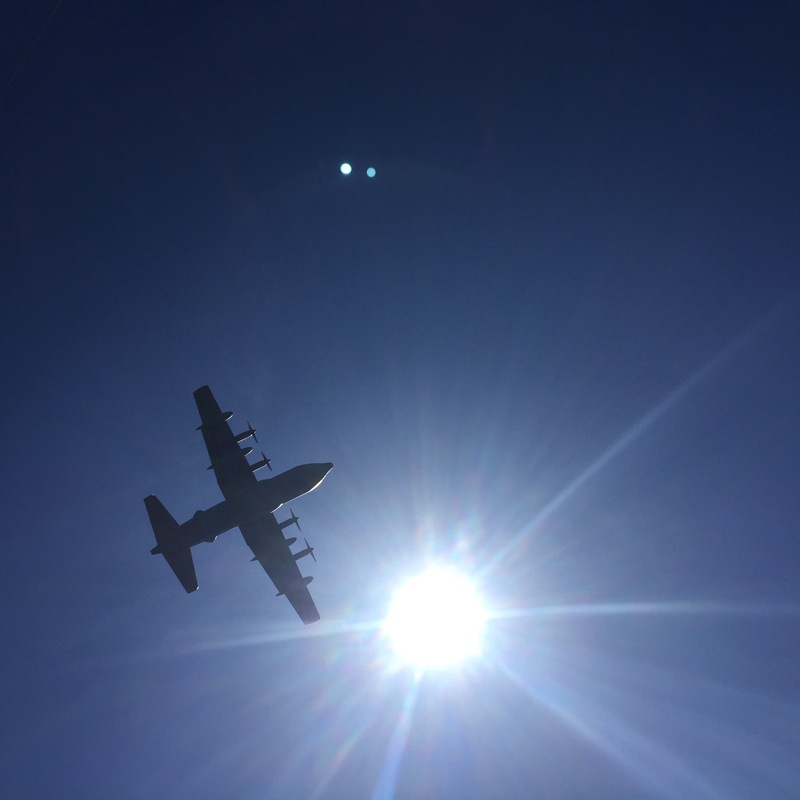 a very loud military plane flew frighteningly low overhead. So low that we could actually see the parachute jumpers standing near the open hatch under the plane! 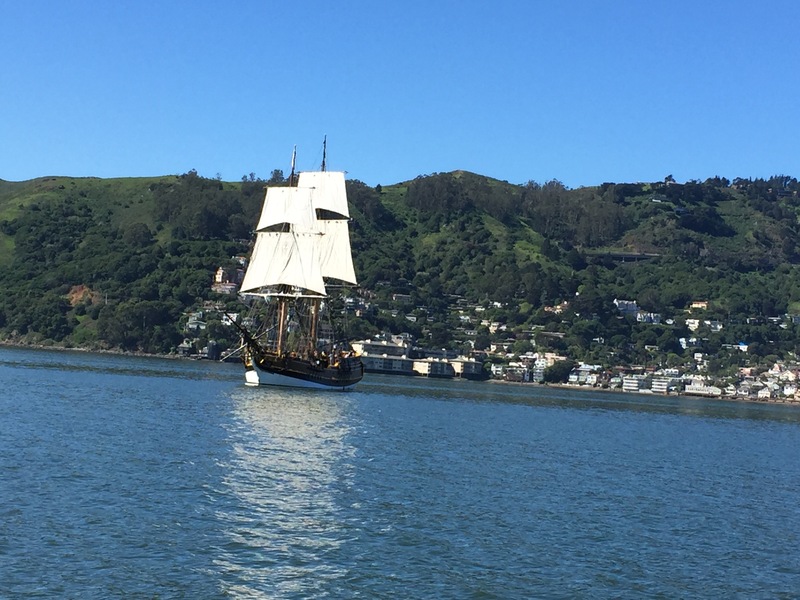 And with that we sailed back to sunny Sausalito in total silence, again having the whole Bay to ourselves and a fine day for sailing it was indeed!